Best estimates put the number of pygmy elephants in Malaysian Borneo at approximately 2,200, but no one can be sure how many have lost their lives in recent years as palm plantations encroach further and further into the rainforest. What is clear is that if the loss of their forest habitat continues to drive conflicts with humans at the rate it is now, Borneo elephants’ long-term survival may be in jeopardy. There have been several high-profile cases, like the 14 elephants that were poisoned last year in Sabah Province, where the majority of Borneo elephants live and where deforestation has claimed huge amounts of forest over the past half-century. More recently, Sabah was the scene of a grisly shooting death of yet another elephant. Borneo elephants (Elephas maximus borneensis) are listed by the IUCN as Endangered, living almost entirely in Sabah (approximately 80 also live in northern Kalimantan). 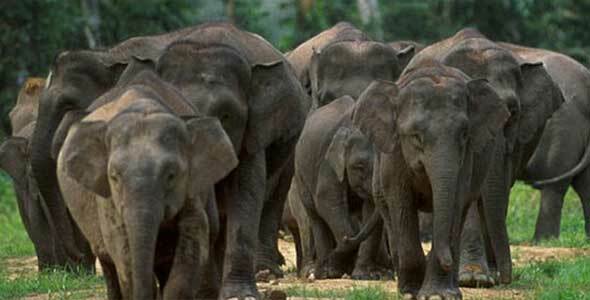 A subspecies of the Asian elephant, Borneo elephants – also called Borneo pygmy elephants – are similar in size to their counterparts in peninsular Malaysia, and are threatened primarily by habitat loss. Malaysia tops Indonesia, Brazil, and Nigeria as the country with the world’s highest rate of deforestation. According to Global Forest Watch, the country lost more than 500,000 hectares of forest in 2012 alone. Sabah, the smaller of Malaysia’s two Bornean states, lost nearly 900,000 hectares of forest between 2001 and 2013 – or about 15 percent of its tree cover. Constricted habitat driven in large part by palm oil expansion is squeezing elephants out of forests and into areas inhabited by humans, leading to increasing rates of human-elephant conflicts and subsequent elephant killings.